If you take a look at the recent history of Amazon product reviews, you might think the online retailer is targeting sellers in an attempt to prevent them from getting reviews. First incentivized reviews were banned, then accounts began to get revoked because of emails that were too aggressive, followed by a global opt-out — all these actions have sent a scare through Sellerville. Don’t give away products in exchange for reviews. Yes, Amazon can track that a person used a 100% off discount code then came back a month later and left a review. Don’t solicit only positive reviews. Amazon wants shoppers to feel free to leave comments whether they be positive, neutral, or negative. Don’t provide a template for buyers to use for reviews. Giving buyers a fill-in-the-blanks outline will not only be considered manipulation, it will also make all your reviews sound exactly the same (aka: suspicious). Don’t pay for reviews. Not from friends, family, or bloggers. The one exception is Amazon Vine. What Amazon is looking for is honesty and genuine responses from actual shoppers. As customers, we would want the same things. I can honestly say that, before the incentivized review ban, I would do a page search to see just how many of a product’s reviews had the word “unbiased” or “honest” in them. If the majority of the reviews had those words, I would not buy the product. I, as a frequent Amazon customer, didn’t trust those product reviews. 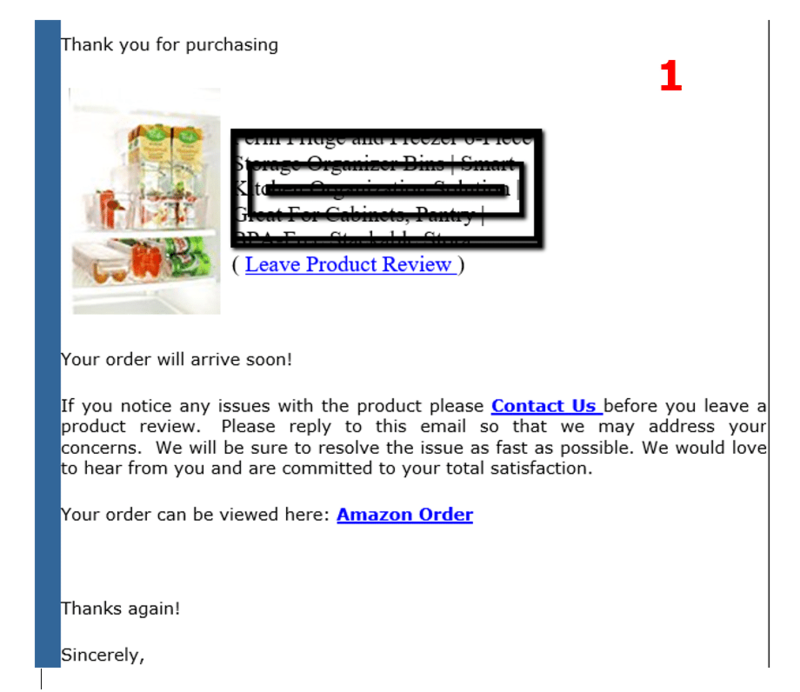 This may be considered by Amazon as an attempt to manipulate reviews because email #1 specifically asks the customer not to leave a bad review, but to instead contact the seller. 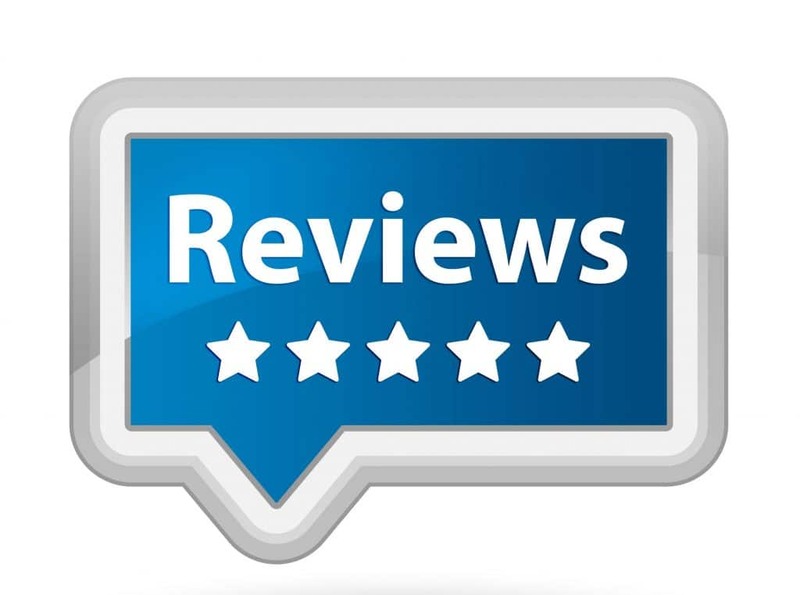 Email #2 states that, if the product has met or exceeded expectations the customer should leave a review. Statements such as, “If you love your new _____, leave a product review here” or “If you’re happy, click here. If you need help, click here” would also fall into the suspicious category and could get you into trouble with Amazon. If you buy a lot on Amazon (like I do), you see the same review request emails coming through all the time. For the simple reason that people have gone blind to them, they no longer produce results very well. This email is all about the seller. It says nothing other than gimme, gimme. So, Just What Can You Do/Say? You can provide useful information that improves your customer’s experience with your product. I’ve verified with Amazon (again just recently) that the techniques we use at Marketing Words when writing review request emails for our clients are still approved and legal. The idea is to offer something that is worth the customer’s time to read. Let’s go back to the first email for the refrigerator/freezer organizer bins. This is actually a product I bought. I immediately put several in my freezer (which is why I initially purchased them) and the rest went in my junk room, where they probably would have lived forever. Then I read something online about using containers (much like the ones I bought) in your kitchen or bathroom cabinets to store spices, makeup, or other items that are hard to organize or find. Light bulb! Back upstairs I went to find the other bins so I could put them to good use. What if the seller had sent me an email that said this? Kitchen cabinets to store/organize spices. Put herbs into one bin, common spices (salt, pepper, garlic powder, etc.) into another container, and the others into a third basket. Bathroom cabinets to organize medicine and makeup. Stop searching through bottles and such every morning. Find your prescriptions, cosmetics, toilet tissue, and more quickly once they are organized. Laundry room for dryer sheets, clothespins, etc. Why pay more for specific laundry-room organizers when these bins do the job perfectly? Got a minute? Tell us (and other shoppers) about your experience with your organization bins when you leave a product review. Have questions? Need help? Just reply to this email and you’ll have our full attention! Can you rearrange the information? Sure! We have one client who needed specific instructions for using his product included at the beginning. (Yes, it was in the listing and in the instruction manual, but — for some reason — this one thing eluded customers.) That info went in the first paragraph, and then we segued into the tips. Thank you for your purchase of the Super-Duper, High-Capacity Desktop Stapler. It should arrive in the next couple of days. A quick note before you use it … you’ll want to remove the small plastic insert at the very back of the staple tray. It’s sometimes a bit hard to see if you aren’t looking for it. Once you take that out, the staples will slide right in and you’re good to go! Crafts — Create gorgeous pin boards, picture frames, and more. Upholstery — Make that old ratty chair functional & fashionable with a quick facelift. Artwork — Design one-of-a-kind pieces that show off your savvy skills. So? What do you think? If you have 3 minutes, we’d love to hear from you in a product review. We’re here to help! If you ever have questions or run into an issue with your stapler, just reply to this email for immediate assistance. Most people don’t like to leave reviews. Even those who see the value in it, and who love to read other people’s reviews, are busy, so the task always falls to the bottom of their priority list. However, if you give customers something worth reading, they will. If they find what you’ve written valuable, they’ll be all the more likely to reciprocate by leaving a review for your product. 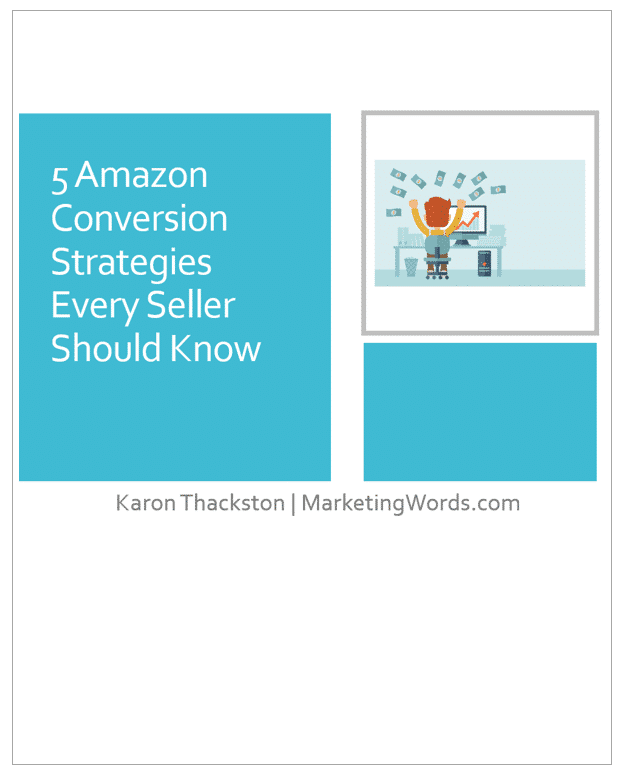 Want even more ideas for creating custom Amazon after-purchase emails that are appreciated and effective? 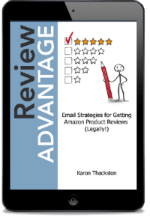 Pick up your copy of my “Review Advantage: Email Strategies for Getting More Amazon Reviews (Legally! )” today. 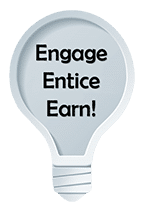 Use coupon revblog10 and save $10! Great stuff! I remember now doing this on another project, and very effective. I will try it on my new line of pet odor products. Need reviews! Agree, getting them is a chore. Thanks again for a great tip!